Sony Ericsson just announced the Sony Ericsson XPERIA X1. Sony Ericsson has signed a deal with Microsoft to produce a phone using the Windows Mobile operating system. This marks the first time that Sony Ericsson has not used the Symbian operating system. The deal between Microsoft and Sony Ericsson was revealed at Mobile World Congress in Barcelona, where Sony Ericsson announced the launch of seven new mobile handsets. One of the coolest new models is the Windows Mobile-based Sony Ericsson Xperia X1, which sports a 3" touch screen similar to Apple's iPhone, a nice 800x400 resolution, 3.2 megapixel camera and a tilt and slide keyboard running on Windown Mobile 6. Sony Ericsson's goal is for the XL to "deliver a seamless blend of mobile web communication and multimedia entertainment." The Sony Ericsson Xperia X1 has a slick GUI that they call a panel interface which are shortcuts to various features or web locations. It will be available in GSM/EDGE and UMTS andHSDPA/HSUPA. Music and video can be played via Windows Media Player and it will also pick up local radio stations with a built-in FM tuner. So the X1 is also great for gyms that use TVs with FM transmitters for the audio. The huge 800x400 resolution is great for surfing the Internet. The X1 measures 110 x 53 x 16.7 mm and weighs 145 grams. Sony Ericsson said that the handset would be released in the later part of 2008 but pricing details were not disclosed. 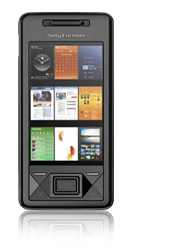 \n Sony Ericsson just announced the Sony Ericsson XPERIA X1. Sony Ericsson has signed a deal with Microsoft to produce a phone using the Windows Mobile operating system. This marks the first time that Sony Ericsson has not used the Symbian operating system. \nThe deal between Microsoft and Sony Ericsson was revealed at Mobile World Congress in Barcelona, where Sony Ericsson announced the launch of seven new mobile handsets. \nOne of the coolest new models is the Windows Mobile-based Sony Ericsson Xperia X1, which sports a 3" touch screen similar to Apple's iPhone, a nice 800x400 resolution, 3.2 megapixel camera and a tilt and slide keyboard running on Windown Mobile 6. Sony Ericsson's goal is for the XL to "deliver a seamless blend of mobile web communication and multimedia entertainment." \nThe Sony Ericsson Xperia X1 has a slick GUI that they call a panel interface which are shortcuts to various features or web locations. It will be available in GSM/EDGE and UMTS andHSDPA/HSUPA. Music and video can be played via Windows Media Player and it will also pick up local radio stations with a built-in FM tuner. So the X1 is also great for gyms that use TVs with FM transmitters for the audio. The huge 800x400 resolution is great for surfing the Internet. The X1 measures 110 x 53 x 16.7 mm and weighs 145 grams. 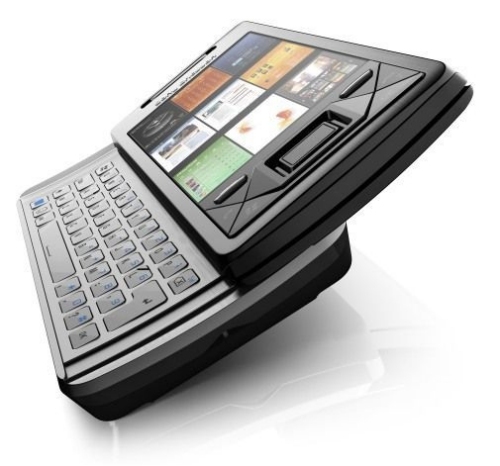 \nSony Ericsson said that the handset would be released in the later part of 2008 but pricing details were not disclosed.